A very successful business associate of mine had a 30-year, $589,000 mortgage with an interest rate of 4.375% on a home he planned to occupy indefinitely. He enjoyed significant benefits from the income tax deduction associated with the mortgage interest. He contacted The Streisand Team requesting a quote for a new 30-year fixed rate mortgage at an interest rate of 3.625%, a rate reduction he believed would produce a significant savings over time. Instead of the mortgage he requested, I recommended my own solution—a 10-year, 3.00%, Interest-Only Adjustable Rate Mortgage (ARM). This would create a much greater savings because not only would he save on the reduced interest rate, but he would also not pay any principal on the new loan, thus creating an opportunity for a significant tax benefit. In addition, he would gain more control over his cash flow and would be able to invest these additional resources. We also recommended that he increase the mortgage to $750,000. This would provide additional funds, $161,000, to be invested. His monthly payment with my mortgage solution would be $1,875 versus his existing mortgage payment of $3,745, a monthly savings of $1,870. With my solution, over a 10 year period his total savings would amount to $224,400 ($1,870 X 120 months). In contrast, the 30-year fixed mortgage he proposed would have reduced his monthly payment to $3,420, a difference of only $325. Over the same 10-year period, his total savings for his proposed mortgage would have been only $39,000 ($325 X 120 months). Being a CPA, he quickly realized the interest-only option I proposed would maximize his income tax deduction since the entire payment would be for interest. Note that on a traditional 30-year mortgage, part of the monthly payment is applied to principal and part to interest, and over time, the portion applied to interest decreases, diminishing the tax benefit. In contrast, the new loan we created for him provided a fixed deduction amount, which is always an attractive benefit for high-income tax rate clients. He expressed concern about his interest rate risk due to the conversion that would take place in year 10. After discussing the various scenarios, we concluded that if interest rates increased during the 10-year period, we could easily modify the mortgage accordingly. If rates remained in their current range during the 10-year period, in year 10 (when the mortgage converted to a variable rate), we could revisit all options, and in any case he would not be required to keep the variable rate mortgage. I told him that in year 10, he might consider a 5-year ARM, which typically offers an interest rate of about 1.5% below the rate on a 30-year fixed rate mortgage. My client also realized that in addition to the tax savings, he could invest the money freed up by his reduced mortgage payment, and ultimately use the generated investment asset to reduce the principal amount of the mortgage after year 10. Assuming that we applied these funds ($1,875/month net of tax is $1,037) to a 4.0% tax-free rate of return, this would create an asset of $152,678 with the additional cash out of $161,000 the investment account would have grown to $392,722. One other factor must be considered. To fully compare the two mortgage scenarios, the amortization of the principal on the old mortgage during the 10 years would amount to 119,000, giving a savings of 43,678 ($152,678 less $119,000). Therefore the benefit of our recommendation using a 4% rate of return over 10 years is $84,007. 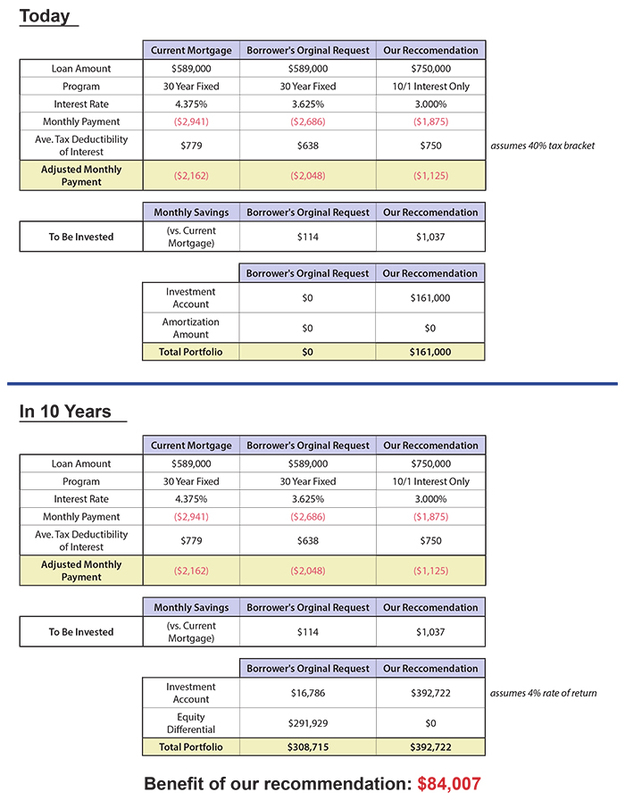 Note that with a 5% rate of return (not unreasonable), the benefit would be $116,565, and with a 6% rate of return, it would be $152,254 (see diagram). In summary, by applying this optimal strategy to restructure my client’s mortgage, we allowed him to (1) enjoy a significant tax benefit and (2) gain control over his cash flow. He was able to invest these newfound resources to create a significant asset that would ultimately outperform the net after-tax interest cost of the original mortgage. In addition, should the home increase in value (as expected), he would accumulate this additional wealth. Yes, rates remain soamwhet low historically speaking. No, mortgage rates have nothing to do with the Fed Funds rate.No, low interest rates are not to blame for people loosing their homes. Greed, timebomb loans and irresponsible borrowing and lending, declining markets and fraudulent appraisals were the real culprits. This is the perfect storm for a mortgage crisis.Banks make there money when they originate loans (junk fees), sell the loans to FNMA and FHLMC (gain on the sale by originating at premium rates) and through servicing income (they make 0.25% per year for processing payments and performing various other admin tasks on the loans the originate. They do not generally hold the paper as they would be exposed the the interest rate risk that caused the S L crisis 20 years ago. That is, if you originate a loan at 6% and rates go to 7%, your 6% mortgage would be worth less than the face amount as it would have to be sold to yield 7%. It may lose as much as 10% of its value. That would errode a banks capital like nothing else and could lead to its insolvency which would threaten the deposit insurance fund.What rates will do in the future is pure speculation. Some market analyst are calling for the 10 year bond yields to fall by the end of the year. If that happens, the required net yields on the mortgage back securities in the secondary market(which drives what rates banks can afford to offer in the retail/primary mortgage market) should fall as well.With that being said, my finance professor told me that we, as consumers, should not speculate about what will happen with interest rates. That is, if you need to borrow and you find a rate that you like, you should take it because it may not be there tomorrow. How true that wisdom rang this January when rates dipped to about 5.375% on a 30 year for about 6 hours before they shot back up 0.5% when the stock market started its recover.Who is really loosing money? The people who insure the loans that are going in to default; the FHA, VA and the PMI companies and some of these other companies that supposedly insured the uninsurable loans called non-prime/sub-prime loans (these companies could not possiblly have charged enough to cover the losses on the loans they insured so they are largely bankrupt) and everyone who had investments in companies that bought into these pools of sub-prime loans.Between the diminished home equity and actual losses due to defaults, I believe the that the actual losses will be around 2 trillion dollars by the time the crisis is really over.All those people who talk about Bears Stern being a watershed are clueless about the liabilities that Countrywide has failed to recoginize. I think there could be hundreds of billions that will be scuttled if the merger with Bank of America goes through. Another back room deal in the making in the name of the governments too big to fail doctrine.